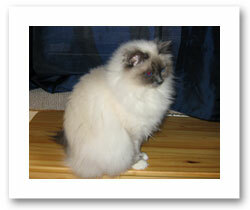 Hanni is a very beautiful and typeful seal point female cat. Her character is absolutely lovely and she is sweet-tempered. Shortly after my youngest daughter turned one, I adopted Hanni. As you may know, kids at the age of one are not very sensitive. The same goes for my daughter and she sometimes hugged Hanni with a little bit too much enthusiasm. Havanna instinctively knew that she must not defend herself. Of corse we taught our daughter to be more caerful and showed her how to treat a cat right. But this showed us what a wonderful character our "Hanni" has. 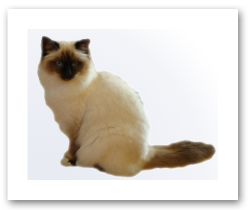 Venice is a very typeful blue-point female cat. Her profile is absolutely wonderful. Her coat is very soft and her eyes are sapphire blue. Venice is a cuddly cat which would snuggle the whole day if you would let her. Venice is always around someone of our family. She loves being in the middle and can always be found where the action is. Venice vomes along when its time to bring our kids to bed, because she knows that the kids will pet her. She also likes sliding down the slide which is on our sons loft bed. On 19 Dezember 2010 Venice received the title Champion. 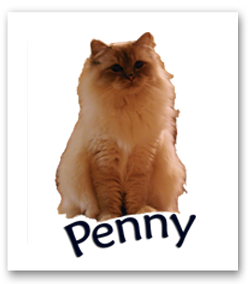 Penny comes from the cattery of my lovely friend Angela - we always and everytime think on you ! !